While the Every Student Succeeds Act (ESSA) pushes for the use of educational activities that have proven their impact, it's less clear how educators are supposed to figure out which programs and practices have sufficient evidence to be worthy of consideration. A new site developed at the Johns Hopkins University Center for Research and Reform in Education hopes to provide "clear and authoritative information on programs that meet the ESSA evidence standards." 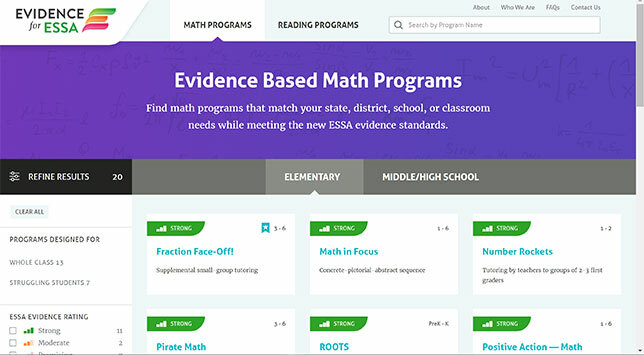 "Evidence for ESSA," as the website is called, covers programs for math and reading, each divided into those appropriate for elementary education and those meant for middle and high school. Currently, the math roster cover 29 offerings; and reading covers 63. Features, such as professional development, textbook or curriculum or tutoring. Each program receives an ESSA rating; a description; pricing information; average effect size; number of students included in the original studies; and details about the program outcomes, staffing requirements and professional development needed. The resource is the product of the Center for Research and Reform in Education at Johns Hopkins, which worked with education advisors and stakeholders from numerous institutions and education organizations to design the website. Evidence for ESSA is online.